﻿1. ﻿Culture ﻿is ﻿shaped ﻿by ﻿behavior, ﻿and ﻿behavior ﻿is ﻿created ﻿by ﻿personal ﻿and ﻿corporate ﻿values. ﻿2. 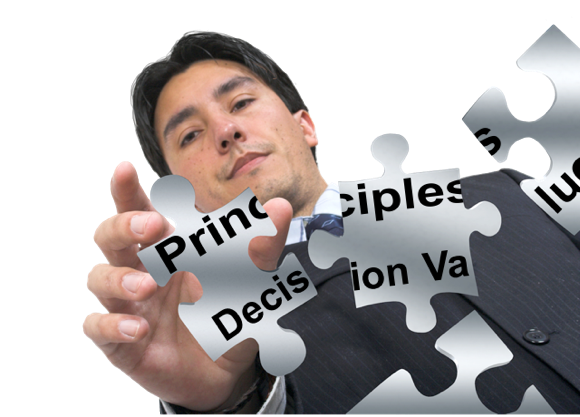 ﻿These ﻿core ﻿personal ﻿and ﻿corporate ﻿values, ﻿used ﻿to ﻿make ﻿all ﻿decisions ﻿within ﻿a ﻿business, ﻿are ﻿defined ﻿by ﻿the ﻿Senior ﻿Executive ﻿team. ﻿3. ﻿In ﻿practice, ﻿these ﻿values, ﻿applied ﻿to ﻿every ﻿decision ﻿made, ﻿enforces ﻿Executive ﻿Intent ﻿throughout ﻿an ﻿organization. ﻿Using ﻿principles ﻿as ﻿a ﻿driver ﻿of ﻿change ﻿is ﻿the ﻿opposite ﻿of ﻿the ﻿vast ﻿majority ﻿of ﻿business ﻿change ﻿efforts, ﻿where ﻿technology, ﻿standards, ﻿or ﻿management ﻿dictates ﻿attempt ﻿to ﻿drive ﻿change. ﻿Change ﻿can ﻿only ﻿be ﻿effectively ﻿delivered ﻿through ﻿a ﻿change ﻿of ﻿behavior, ﻿and ﻿this ﻿behavior ﻿is ﻿defined ﻿through ﻿Executive ﻿Intent. ﻿We ﻿look ﻿at ﻿business ﻿in ﻿a ﻿totally ﻿different ﻿way. ﻿We ﻿don’t ﻿look ﻿at ﻿business ﻿as ﻿projects ﻿and ﻿budgets, ﻿but ﻿rather ﻿as ﻿a ﻿systemic ﻿inter-relationship ﻿of ﻿human ﻿behaviors ﻿– ﻿behavior, ﻿that ﻿when ﻿understood, ﻿can ﻿be ﻿managed ﻿to ﻿radically ﻿change ﻿how ﻿you ﻿work, ﻿optimizing ﻿the ﻿performance. ﻿Critical ﻿thinking ﻿and ﻿the ﻿decisions ﻿making ﻿process ﻿are ﻿greatly ﻿enhanced ﻿when ﻿you ﻿have ﻿a ﻿consistent ﻿value ﻿based ﻿framework ﻿to ﻿facilitate ﻿consistency ﻿in ﻿those ﻿decisions. ﻿We ﻿avoid ﻿being ﻿involved ﻿in ﻿“fire-fighting”, ﻿but ﻿preferably, ﻿building ﻿“sprinkler ﻿systems”. ﻿Rather ﻿than ﻿focus ﻿on ﻿the ﻿individual ﻿projects, ﻿we ﻿concentrate ﻿on ﻿identifying ﻿and ﻿improving ﻿the ﻿systemic, ﻿cultural, ﻿organizational, ﻿or ﻿behavioral ﻿characteristics ﻿that ﻿impede ﻿effective ﻿delivery ﻿of ﻿business ﻿value ﻿through ﻿information ﻿technology, ﻿leveraging ﻿your ﻿existing ﻿wealth ﻿of ﻿talent, ﻿and ﻿getting ﻿everyone ﻿making ﻿decisions ﻿for ﻿the ﻿same ﻿reasons ﻿and ﻿in ﻿line ﻿with ﻿core ﻿decision ﻿values. ﻿Turning ﻿executive ﻿intent ﻿into ﻿action. ﻿Our ﻿track ﻿record ﻿speaks ﻿for ﻿itself. ﻿With ﻿over ﻿$2B ﻿in ﻿tangible, ﻿measured ﻿savings ﻿delivered, ﻿and ﻿a ﻿clientele ﻿that ﻿includes ﻿more ﻿than ﻿a ﻿dozen ﻿Fortune ﻿1000 ﻿companies ﻿– ﻿including ﻿5 ﻿Fortune ﻿100s ﻿– ﻿and ﻿equally ﻿useful ﻿to ﻿small ﻿as ﻿start ﻿up ﻿organizations, ﻿we ﻿can ﻿bring ﻿real ﻿value ﻿– ﻿in ﻿very ﻿short ﻿timeframes ﻿– ﻿to ﻿your ﻿organization.